The complement system, interacting with its regulatory molecules and cellular receptors, plays a central role in the induction and regulation of immunity. Partial or complete deficiencies of the components of the complement system, including its receptors and regulatory proteins, are now described in humans and may be of a genetic or familial origin or acquired. Note the image below, as well as the article Pediatric Complement Receptor Deficiency may be helpful. Four distinct complement receptors, CR1, CR2, CR3, and CR4, have been described for the surface-bound complement fraction C3 and its cleavage fragments. Activation of the complement cascade always leads to the enzymatic cleavage of complement fraction C3, which is important in host defense to bacterial infections and phagocytosis. Receptors for the anaphylatoxins C3a and C5a have also been identified. CR1/CD35 and CR2/CD21 are major receptors for activated fragments of C3. They are single-chain molecules present on host cellular membranes and belong to the complement control protein family. They are encoded by separate but linked genes termed regulation of complement activation (RCA) genes, located on the q32 region of chromosome 1. The receptors are widely expressed in humans. They tend to enhance the effects of complement and are highly important in the binding of opsonized immune complexes on B cells. CR1/CD35 is the receptor for C3b. The CR1 receptor preferentially binds C3b that is covalently attached to immune complexes, and it has a weaker affinity for bound C4b and iC3b. It is a single-chain membrane glycoprotein of approximately 200 kd that has 4 allotypic forms on myeloid cells (eg, erythrocytes, granulocytes, monocytes), lymphoid cells (mostly B cells), follicular dendritic cells, and glomerular podocytes. The density of CR1 receptors on cell surfaces varies with the cell type and with the activation of the cell for neutrophils and monocytes. Because of their high numbers, red blood cells express an average of 90% of the CR1 receptors despite their having a lower number of antigenic sites per cell. Among healthy individuals, the number of CR1 receptors on the red blood cells varies widely, yet the phenotypic expression, regulated by 2 codominant alleles, is stable. CR1 also regulates complement activation by acting as a cofactor for factor I in the cleavage and degradation of bound C3b and C4b to its inactive forms. It also is involved in the generation of ligands for CR2 and CR3, which are believed to be involved in the clearance of immune complexes. CR2/CD21 interacts with C3b degradation products C3dg and C3d and can act synergistically with the B-cell antigen receptor (BCR) in B-cell activation. CR2/CD21 is a single-chain membrane glycoprotein of approximately 150 kd. C3d-or C3dg-bearing immune complexes can bind to CR2. C3dg and C3d also can bind to the surface of bacteria and fungi, allowing CR2 on B cells and follicular dendritic cells to present the organisms for immune triggering. CR2 is expressed primarily on lymphoid cells (B and T lymphocytes) and follicular dendritic cells. CR2 plays an important role in the presentation of antigen to specific B and T cells and in the control of B-cell proliferation. Evidence clearly suggests that CR2 is involved in the induction of a primary humoral response. Humoral antibody response is regulated by the direct effect of C3dg on the cell cycle of B cells and by the dependence of the B-cell response to a soluble T-cell–dependent antigen on iC3b and C3dg. A second component of CR2 binds the Epstein-Barr virus (EBV). EBV requires the CR2 receptor to enter the cell. EBV is an oncogenic herpes virus that is implicated in the pathogenesis of acute mononucleosis, Burkitt lymphoma, and nasopharyngeal carcinoma. It infects and immortalizes B lymphocytes by binding CR2 in vitro. CR3 (CD11b/18) and CR4 (CD11c/18) both bind to iC3b and promote adhesive interactions of leucocytes with the vascular endothelium. The receptors may act as ligands for adhesion molecules, such as intercellular adhesion molecule 1 (ICAM-1)/CD54 for CR3. They are present on phagocytic cells. Both are members of the beta integrin family. They are heterodimers made of an identical 95-kd beta chains (CD18) and different alpha chains (165 kd for CD11b in CR3 and 150 kd for CD11c in CR4). The beta subunit is shared by another plasma membrane protein lymphocyte function associated antigen (LFA-1 or CD11a/18). CR3 (CD11b/18) is found on eosinophils, basophils, monocytes, natural killer (NK) cells, most tissue macrophages, and neutrophils. It has a role in cellular adhesion and aggregation, particularly that of neutrophils and monocytes. CR4 (CD11c/18) is similar to CR3 structurally, has a similar affinity for iC3b, and is found on neutrophils. CR3 and CR4 have an important role in host resistance to infection. iC3b-coated immune complexes have a high affinity for the CR3 receptor on phagocytic cells of the liver and spleen, to where they are transported and degraded. Leukocyte adhesion deficiency type 1 (LAD-1) is an autosomal recessive disorder caused by mutations in the ITGB2 (CD18) gene and characterized by recurrent severe infections, impaired pus formation, and defective wound healing. Somatic revertant mosaicism may be seen with LAD-1. A patient was described as a compound heterozygote bearing 2 different frameshift mutations that abrogate protein expression. 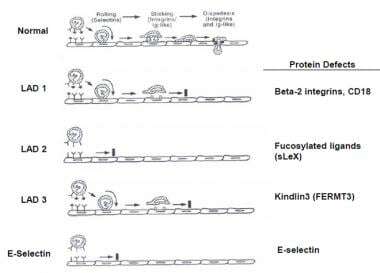 Leukocyte adhesion deficiency type III is caused by mutations in KINDLIN3, affecting integrin activation. While LAD-I patients experience recurrent bacterial infections, those with LAD-III have symptoms of both LAD-I and Glanzmann thrombasthenia. Both genetic and acquired factors have been associated with complement receptor deficiencies. Partial or complete deficiencies in all components of the complement, as well as its regulatory proteins and receptors, were described in a relatively small number of patients in association with autoimmune or infectious diseases. The deficiencies were either inherited or acquired. No specific racial pattern is noted. Receptor deficiencies associated with autoimmune disorders (eg, SLE) are more common in women than in men. Individuals of all ages may be affected. Reduced numbers of cellular receptors are present in preterm and stressed neonates. The leucocyte adhesion deficiency syndrome associated with deficiencies of CR3 and CR4 occurs mainly in children. The prognosis may be guarded in severe cases. Complement plays a major role in the modulation of immune complex formation and its deposition, leading to tissue injury. Deficiencies in complement receptors are associated with a high frequency of immune complex diseases and infections. No predisposition to lymphoreticular malignancies is reported. Kubagawa H, Kubagawa Y, Jones D, Nasti TH, Walter MR, Honjo K. The Old but New IgM Fc Receptor (FcµR). Curr Top Microbiol Immunol. 2014. 382:3-28. [Medline]. Weaver DJ Jr, Reis ES, Pandey MK, Köhl G, Harris N, Gerard C, et al. C5a receptor-deficient dendritic cells promote induction of Treg and Th17 cells. Eur J Immunol. 2010 Mar. 40(3):710-21. [Medline]. Ghannam A, Fauquert JL, Thomas C, Kemper C, Drouet C. Human complement C3 deficiency: Th1 induction requires T cell-derived complement C3a and CD46 activation. Mol Immunol. 2014 Mar. 58(1):98-107. [Medline]. Fairweather D, Frisancho-Kiss S, Njoku DB, Nyland JF, Kaya Z, Yusung SA, et al. Complement receptor 1 and 2 deficiency increases coxsackievirus B3-induced myocarditis, dilated cardiomyopathy, and heart failure by increasing macrophages, IL-1beta, and immune complex deposition in the heart. J Immunol. 2006 Mar 15. 176(6):3516-24. [Medline]. Jacobson AC, Weis JJ, Weis JH. Complement receptors 1 and 2 influence the immune environment in a B cell receptor-independent manner. J Immunol. 2008 Apr 1. 180(7):5057-66. [Medline]. Boos L, Campbell IL, Ames R, Wetsel RA, Barnum SR. Deletion of the complement anaphylatoxin C3a receptor attenuates, whereas ectopic expression of C3a in the brain exacerbates, experimental autoimmune encephalomyelitis. J Immunol. 2004 Oct 1. 173(7):4708-14. [Medline]. Crider A, Feng T, Pandya CD, Davis T, Nair A, Ahmed AO, et al. Complement component 3a receptor deficiency attenuates chronic stress-induced monocyte infiltration and depressive-like behavior. Brain Behav Immun. 2018 May. 70:246-256. [Medline]. Nikiforovich GV, Baranski TJ. Structural mechanisms of constitutive activation in the C5a receptors with mutations in the extracellular loops: molecular modeling study. Proteins. 2012 Jan. 80(1):71-80. [Medline]. [Full Text]. Nabizadeh JA, Manthey HD, Steyn FJ, Chen W, Widiapradja A, Md Akhir FN, et al. The Complement C3a Receptor Contributes to Melanoma Tumorigenesis by Inhibiting Neutrophil and CD4+ T Cell Responses. J Immunol. 2016 Jun 1. 196 (11):4783-92. [Medline]. Tone Y, Wada T, Shibata F, Toma T, Hashida Y, Kasahara Y, et al. Somatic revertant mosaicism in a patient with leukocyte adhesion deficiency type 1. Blood. 2007 Feb 1. 109(3):1182-4. [Medline]. Svensson L, Howarth K, McDowall A, Patzak I, Evans R, Ussar S, et al. Leukocyte adhesion deficiency-III is caused by mutations in KINDLIN3 affecting integrin activation. Nat Med. 2009 Mar. 15(3):306-12. [Medline]. Yashoda-Devi BK, Rakesh N, Devaraju D, Santana N. Leukocyte adhesion deficiency type I--a focus on oral disease in a young child. Med Oral Patol Oral Cir Bucal. 2011 Mar 1. 16(2):e153-7. [Medline]. Fearon DT. Identification of the membrane glycoprotein that is the C3b receptor of the human erythrocyte, polymorphonuclear leukocyte, B lymphocyte, and monocyte. J Exp Med. 1980 Jul 1. 152(1):20-30. [Medline]. Asokan R, Banda NK, Szakonyi G, Chen XS, Holers VM. Human complement receptor 2 (CR2/CD21) as a receptor for DNA: implications for its roles in the immune response and the pathogenesis of systemic lupus erythematosus (SLE). Mol Immunol. 2013 Jan. 53(1-2):99-110. [Medline]. [Full Text]. Dragon-Durey MA, Blanc C, Marinozzi MC, van Schaarenburg RA, Trouw LA. Autoantibodies against complement components and functional consequences. Mol Immunol. 2013 Dec 15. 56(3):213-21. [Medline]. Nord KM, Pappert AS, Grossman ME. Pyoderma Gangrenosum-like Lesions in Leukocyte Adhesion Deficiency I Treated with Intravenous Immunoglobulin. Pediatr Dermatol. 2011 Mar. 28(2):156-61. [Medline]. Bautsch W, Hoymann HG, Zhang Q, Meier-Wiedenbach I, Raschke U, Ames RS, et al. Cutting edge: guinea pigs with a natural C3a-receptor defect exhibit decreased bronchoconstriction in allergic airway disease: evidence for an involvement of the C3a anaphylatoxin in the pathogenesis of asthma. J Immunol. 2000 Nov 15. 165(10):5401-5. [Medline]. Kallenberg CG. Pathogenesis and treatment of ANCA-associated vasculitides. Clin Exp Rheumatol. 2015 Oct 12. [Medline]. Qasim W, Cavazzana-Calvo M, Davies EG, Davis J, Duval M, Eames G, et al. Allogeneic hematopoietic stem-cell transplantation for leukocyte adhesion deficiency. Pediatrics. 2009 Mar. 123(3):836-40. [Medline]. Moutsopoulos NM, Zerbe CS, Wild T, Dutzan N, Brenchley L, DiPasquale G, et al. Interleukin-12 and Interleukin-23 Blockade in Leukocyte Adhesion Deficiency Type 1. N Engl J Med. 2017 Mar 23. 376 (12):1141-1146. [Medline].